The detective Mr. Moh, an enthusiastic gardener, is angered by the wanton destruction of his neighbour Miss Hyde’s flower-beds. He enlists the help of his friend Inspector Gorham to prevent further herbaceous vandalism – but the second they’re on the case the corpse of a naked woman is found in the next-door garden. No one appears to have known the dead woman well, or have had good reason to strangle her. Yet the home’s owner, Lewis Hardwicke, has returned from abroad unexpectedly at almost exactly the same time as the murder. And the woman’s hat has been found on the premises of another neighbour’s house . . . why was it necessary to silence the unfortunate Ellen Shields? Why was Miss Hyde’s dog missing, then injured? And why have the flowerbeds been trampled? Trust Mr. Moh and Inspector Gorham to solve this most baffling of cases. 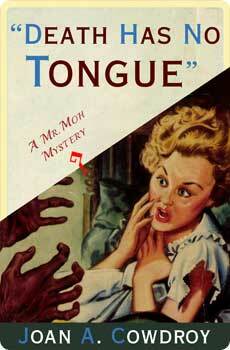 Death Has No Tongue was originally published in 1938. This new edition features an introduction by crime fiction historian Curtis Evans.